4 Technology Advances in Wireless Capsule Endoscopy - Ignite Ltd.
Few words evoke less enthusiasm than endoscopy. And while that is not likely to change any time soon, capsule endoscopy technology offers a less-invasive procedure 75 million patients every year. In this article, we explore how swallowable cameras give doctors new insights into diseases of the gastrointestinal tract. But first, a look at conventional methods doctors use to take a peek inside. The word “endoscopy” means “looking inside”. In the medical field, doctors use various types of instruments to peer inside the body. Endoscopes enable them to look inside the digestive system, hollow organs, and other body cavities with no or minimal surgical incisions. Traditionally, doctors and surgeons have used borescopes to inspect patients’ esophagus, stomach, and large intestine. Endoscopes combine a miniature camera and an illumination source into a small cylindrical device that can be inserted into the body using a flexible tube. By viewing various parts of the GI tract, doctors can better diagnose the causes of abdominal pain, swallowing disorders, bleeding, unusual vomiting, persistent heartburn, and other disorders. Not only can GI tract inspection help identify causes of discomfort, but it can also be invaluable in early diagnosis of cancers and other diseases. Advances in gastrointestinal endoscopy allow doctors to view the complete GI tract without the need to insert borescope into the patient. Capsular endoscopy places the camera and light source inside a swallowable capsule, eliminating the need for an insertion tube. During the capsule endoscopy procedure, the patient swallows the vitamin-sized capsule with water. The device travels through the entire gastrointestinal tract before exiting the body, capturing images as it goes. During the 8-12 hour procedure, the capsule sends images to a recording device worn near the patient’s waist. At the end of the procedure, the doctor downloads the images from the external recorder for viewing and analysts. 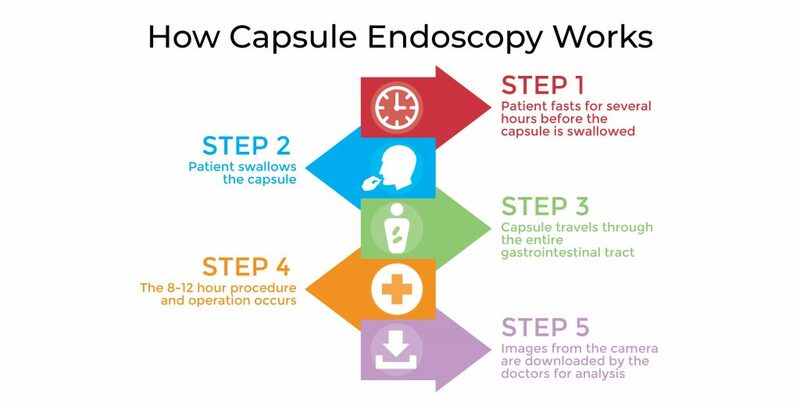 Capsule endoscopy is generally as easy as swallowing a large vitamin, and the patient can go about most of his or her daily activities immediately. The only preparation necessary is usually fasting for several hours before the device is swallowed. In some instances, a laxative might be prescribed. Various types of endoscopic capsules are on the market. Some capsules include only one camera, while others include two or even four. Even though the wondrous capsules represent the latest endoscopy technology, they do not completely eliminate the need for traditional borescope-type endoscopes. Depending on the nature of the disorder being diagnosed, capsule endoscopy might be the only imaging device used by the doctor, or it might be used before traditional endoscopy or as a follow-up procedure. Capsule endoscopy is often described as a new technology. And in many ways it is. The higher resolution of miniature cameras, increased image-capture rates, improved lenses, a wider field of view, and reduced device size make the latest generation devices far superior to earlier models. But the history of endoscopic capsules is worth remembering. The diagnostic pill was invented by Israeli engineer Gavriel Iddan in the 1990s. Iddan’s first endoscopic capsule, the M2A, was approved by the U.S. Food and Drug Administration (FDA) for use in small intestine visualizations in August of 2001. In 2000, doctors from the U.K developed a capsule 1-⅛” long, and ⅜” wide, used to detect bleeding of the small intestine. The device had a camera, a light source, a battery, and a small transmitter. The device captured two images per second — up to 55,000 images during its eight-hour trek through the digestive system. The latest generation of EC devices go beyond capturing still images and send high-resolution video to the recording device during their 8-12 hour journey through the body. Like every medical device or procedure, capsule endoscopy has both benefits and risks. Let’s look at a few of the pros and cons, compared with traditional endoscopy. As you can see, the advantages of using the capsule greatly outweigh the risks. Preparation for the procedure is minimal. That’s it. No long list, here. 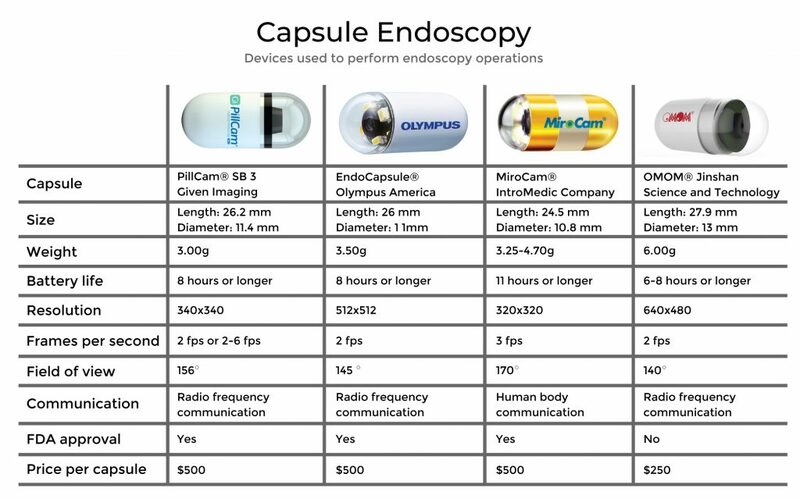 The capsule endoscopy market isn’t exactly exploding, because regulatory approvals are required before marketing medical devices and procedures. However, four companies have each established themselves as leaders in this profitable market. The PillCam™ is the successor to the first EC device that I mentioned earlier — the M2A. Medtronic has expanded the PillCam™ to include the following capsules, each designed to target a specific issue or section of the GI tract. The PillCam™ Crohn’s System capsule provides imagery of the entire bowel, giving doctors views of the health of the GI tract that are not available by other methods. It is designed to help doctors accurately diagnose Crohn’s disease, a rare but debilitating inflammatory bowel disorder. The PillCam™ SB 3 System aids in the diagnosis of a number of disorders of the small bowel, including ulcers, bleeding, detection of lesions and other abnormalities. The device detects its travel speed and optimizes the frame rate accordingly. The PillCam™ UGI System specifically identifies bleeding in the esophagus, stomach, and duodenum, or upper GI tract, as it is also known. Frame captures run at 35 fps for the first 10 minutes of the procedure and 18 fps for the remaining 80 minutes, improving image relevancy. The PillCam™ COLON 2 System provides a non-invasive means of thoroughly inspecting the colon to detect the presence of precancerous polyps. An extra-wide view and dynamic frame rate ensure optimum visualizations. More than two-million Medtronic endoscopic capsules have been used worldwide. The EndoCapsule 10 platform capitalizes on Olympus’ superior imaging technology. Thanks to advanced image processing, redundant and irrelevant images are eliminated, resulting in a 64% reduction in the time it takes the doctor to review the images. Viewing software allows doctors to view a 3D image of the small intestines, as captured by the EndoCapsule 10 device. China is no new arrival when it comes to GI medical devices. Jinshan has been a major player in the market since it started in 1998. The OMOM Capsule Endoscopy Platform represents one of the company’s five product lines. The OMOM CE device features excellent image quality, wide viewing angle, 10+ hours of battery life, and auto-pairing with recording device. A simple viewing interface makes it easy for doctors to review the recorded imagery after the procedure. The CapsoCam Plus CE capsule, developed in Silicon Valley, provides a full 360º panoramic lateral view of the small bowel mucosa. Superb image quality speeds diagnosis of Ampulla of Vater, Crohn’s disease, Ectasia melanoma, and submucosal masses. Most CE devices use end-to-end cameras. The CapsoCam Plus takes a different approach. Its four onboard cameras are positioned laterally, which allows the device to capture full panoramic images of the small intestines. In June of 2018, Pentax Medical announced an agreement with CapsoVision to be the exclusive U.S. sales agent for the CapsoCam Plus system, including CapsoCloud and CapsoView. The miniaturization that makes EC devices possible is a marvel unto itself. Reducing desk-sized video cameras of the 1960s to cameras small enough to swallow was no small feat. Even so, the microelectronics of CE devices would be of little use without powerful image processing software. High-powered image processing is necessary to string the captured images together for viewing by the doctor. But it doesn’t end there. Most CE device platforms provide advanced features that help doctors and surgeons make the most accurate diagnoses, based on the images provided. Looking back at the popular PillCamTM product line, for example, the RAPID Reader desktop software downloads recorded images from the device recorder and processes the video and images for viewing by the physician. Even though the software offers tools to aid in diagnosis, it is intended to be used only by qualified medical professionals. Capsule endoscopy is a regulatory-approved and effective diagnostic procedure for identifying abnormalities of the GI tract. Continued studies only prove the value of CE technology in diagnosing digestive system disorders. Let’s look at a few of those studies, and see how they put the CE capsules through their paces. The National Center for Biotechnology Information published a study that offers some impressive numbers on the effectiveness of capsule endoscopic devices. The study indicated that bleeding was detected in 64.3% of patients using EC capsules, compared with 31.1% of traditional endoscopic procedures. Publisher of peer-review journals, Hindawi, published a study that investigated the effectiveness of performing two successive CE procedures, each using a different model of CE capsule. The study involved the MiroCam (IntroMedic, Seoul, Korea) and Medtronic PillCam SB 3. The conclusion indicated a 75% increase in the detection rate of duodenal papilla, compared with using a single CE capsule. Research information provider ScienceDirect published a study in June that evaluated the safety and effectiveness of CE capsule procedures. According to the study findings, capsule endoscopy is effective as a diagnostic tool for evaluating the upper GI tract, while no apparent elevated risks were indicated. BMC Gastroenterology published a study to investigate the effectiveness of drinking coffee and, alternatively, chewing gum as a means to speed the passage of CE capsules through the body. While neither was proven to reduce the time span of the capsule passage through the GI tract, the study did recommend a separate gum-chewing study be conducted. At least there is a chance chewing gum might finally be prescribed for something. As new endoscopy technology emerges, we will surely see improved image quality. But what else might we expect to see happen with these marvelous little devices? It’s just a guess, but maybe we can drive them. At least one study suggests that the lack of steerability is a limitation of CE capsules. The same study goes on to suggest that future capsules might be controllable, allowing the doctor to direct the device toward areas of concern within the GI tract. And if we can steer them toward an abnormality, maybe we can direct them dispense treatment at the affected location. Perhaps endoscopic capsules will be hybrids of visualization components and micro-robots, which can perform non-invasive surgery within the digestive system. Recent advances in gastrointestinal endoscopy provides fertile ground for cutting-edge technologies. Advances in super-miniaturization of video cameras, batteries, and transmitters offer life-saving possibilities for players who are willing to stay in for the long hall. Problem is, success in this market won’t be as easy as you might think. To get your product from the development lab to the medical lab, you will need software to make it work. But the software you need doesn’t come off a shelf. That is where Ignite comes in. We are a global leader in outsourced software solutions, and we were developing in MedTech before there even was a MedTech. We have extensive experience developing custom endoscopic software solutions, custom cloud-based platforms, medical apps, and all the supporting layers you could ever need. You need MedTech? We’ve got the stack. Contact us, today, for a no-cost consultation.